Fire tables | Visit Firepit-online.com for all offers! Nowadays the garden is increasingly becoming an extension of our living rooms. Our lives are moving more and more to the outdoors and we would like to have a little extra comfort and cosiness there too. Cosi Fires fire tables are perfect for this! These stylish lounge tables are not only practical and comfortable, they also provide a great atmosphere! The Cosi fires gas fireplaces are available in different shapes, sizes and trendy colours. Read more here about the Cosi fires fire tables. Fire tables are the new garden trend. They are lounge tables with a comfortable, built-in gas fireplace that can be connected to a 5 kg gas cylinder. Without a doubt, fire tables will give your garden a great appearance. The product range of the brand Cosi-fires contains two types of fire tables. Cosi Fires has a fire table of Douglas wood, called the Cosicube, and a series of round fire bowls, the Cosidrums. The Cosicube is a stylish fire table which is available both in a square model and rectangle model. The fire table features a comfortable gas fireplace that's very easy to ignite by means of an electronic ignition. You can, decide on the height of the flame yourself, using the practical dial. The Cosidrum is more of a gas fireplace in the shape of a large flowerpot than a fire table. 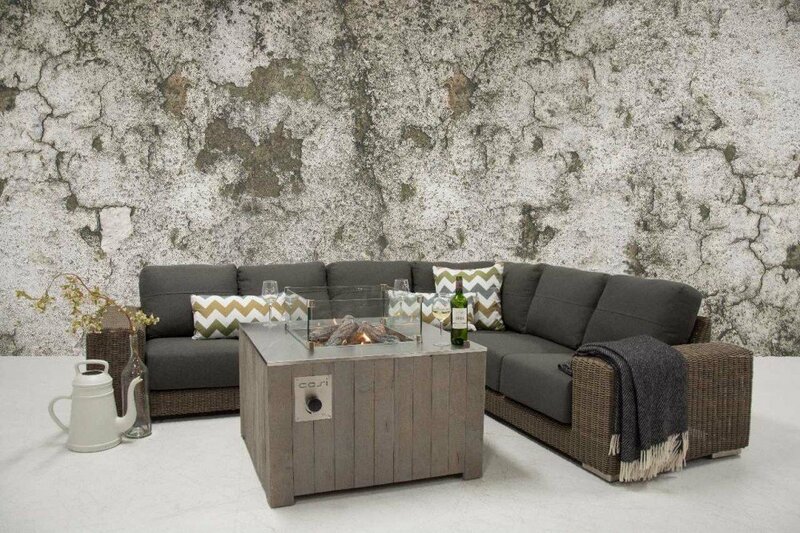 This trendy cosidrum gas fireplace is a true eye-catcher on your patio and available in three different sizes and no less than four different colors: White, grey, charcoal grey and lime green. There is something for everyone! Fire tables come standard including the ceramic logs, lava rocks, a protective case and in some cases with a gas pressure regulator. In addition, you can expand almost all fire tables with all kinds of fun and practical accessories. How about a trendy wine cooler, side tables on which you can put your snack and drinks, or a griddle? You can assemble your own fire table. For extra security you could order a glass screen surround. Did you make up your mind? Then order your beautiful fire table now! The range of fire tables is enormous. If you have made your choice, you can order the fire table online. If you order before 17.00, your the fire table will be shipped the same day for a quick delivery!